The weather has turned. Overnight. I woke in the small hours of the morning dreaming that I was being force-fed ice cream and not liking it much. Trying to snuggle in against Mr Tabubil, I found that he’d he had taken his half of the blankets and rolled himself around and around like a caterpillar, so I climbed out of bed and padded barefoot across the icy floor and to drag the rug up onto the bed with me. Morning dawned sunless and sullen, with a dark, heavy sky. Cold, dark days inexorably bend my mind to thoughts of cooking. Hot food. Comforting food. Scones. The pantry being unaccountably bare of clotted cream, I took my mother's scone recipe and swopped the sugar for mustard powder and tipped in a cup of grated parmesan cheese(a canny pantry keeper NEVER being short of a good nippy cheese) and set to stirring. The scones came out hot and steaming and vaguely redolent of pizza, but something was missing so we peeled half a bushel or so of vegetables and whipped up a tureen of fragrant, autumnal,pumpkin soup. Between Madeira Cakes One and Two, Mr Tabubil made a run to the shops for more eggs and came back with an incidental sack full of whipping cream, so we shrugged our shoulders and whipped up a metric lake (give or take a liter) of that as well. With sugar and vanilla. All of this sweet stuff was starting to jangle on our taste buds, so we rounded out the afternoon with a batch of Oatmeal Raisin Cookies. The oatmeal sounded healthy, and cookies looked granola-ish and virtuous, but as they stood steaming on the counter. Mr Tabubil began to swear that he could hear them begging to fulfil their true destiny as the world’s greatest ice-cream sandwiches. He even pulled The Perfect Scoop back off the shelf and searching the index for vanilla ice-cream, but it was dinnertime, so we stopped. And looked at the trays and tureens all around us, and began to wonder who might be available to help us eat some of it. And possibly begin to sweep up some of the flour on the kitchen floor. The weather boffins are promising us a cold, wet winter, but if it doesn't clear up and let us out of the kitchen once in a while, what this winter is going to be is spherical. *That old canard about opening an oven door on a rising sponge cake on a cold day? It's true. I opened the oven door a squeak to toss in a last dusting of sugar glaze and that sponge opened up like a Florida sinkhole on the first day of the rainy season and sank without even a sigh. Mix the topping ingredients together in small bowl. Sift the flour into a large bowl and stir in the dry ingredients. Cut the butter into the flour with a knife, and use your fingertips to work the butter into the flour, working quickly until you have a bowl of fine crumbs, without any loose unmixed flour at the bottom of the bowl. Accordingly, turn the scone mixture onto a lightly floured surface and with your hands, form the dough into a mound and knead lightly. Bring the dough together, flatten it down, turn it over - for no more than a minute perhaps, until the dough is springy and one defined mass. If the dough is wet and refusing to form, add flour a spoonful at a time until the dough coalesces. 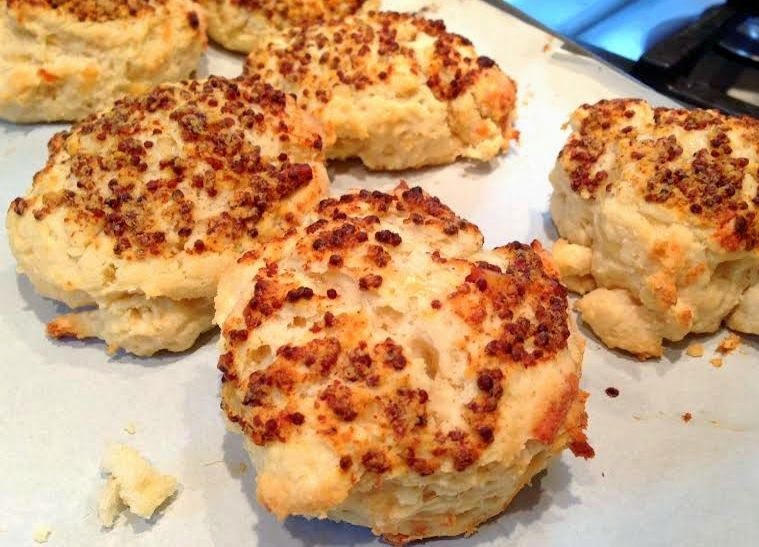 Spread the tops of the scones with the topping recipe.